By all means, let’s look at the facts. The staff, led by a coalition of lame-duck commissioners headed by Steffanie Musich, wants to close the golf course, and the excuse they are giving is that the pumping necessary to keep the course dry enough to play exceeds the amount of water in the DNR permit. The DNR hadn’t complained. But the Park Board went to them and confessed to the crime and promised to reduce the pumping. In addition to describing what would happen if you reduced pumping at Hiawatha, the Barr Study also said you could lower the level of Lake Hiawatha (and, thereby, reduce the threat of flooding and the need for pumping) by removing the dam at 27th Avenue. But that’s an Inconvenient Fact that the Park Board chose to ignore. According to the Barr Engineering Minnehaha Creek Survey there is a 4-foot drop from the lake level at 812 feet above sea level to the base of the dam that is 808 feet above sea level. Remove the dam and you lower the water level of Lake Hiawatha. That’s pretty elementary physics. 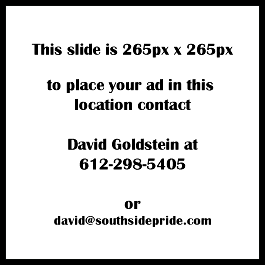 The 2014 Golf Convergence Study of Minneapolis municipal courses (commissioned by the Park Board) said Hiawatha was the course most likely to make money because of its location, and within a five-mile radius there are more than 8,000 active golfers. Prevailing prejudices meant restricted membership in private courses. Golf courses were private until the end of the 19th century, and “No Irish Need Apply.” Publicly owned municipal courses ended this prejudice, and golf became accessible to everyone by the early 20th century. Hiawatha opened in 1934 and from its beginning it was open to everyone in South Minneapolis. Blacks, Latinos, Asians, South Asians, Somalis—all play at Hiawatha. In 1939 Hiawatha hosted the first African-American golf tournament in the country, the Upper Midwest Bronze Amateur Tournament. Blacks were not admitted as members to Augusta National, the home of The Masters, until 1990. Women weren’t allowed as members at Augusta until 2012. One of the legends I grew up with, living a couple of blocks from Hiawatha, was that heavyweight champion Joe Louis, The Brown Bomber, hit a five iron on the third hole and put it through a picture window across 43rd Street at one of the early Bronze Tournaments. It will be a shame to lose this community and cultural resource. It’s not closing because of the money. Of all the city courses it could be the most profitable, and it has contributed money to the general fund to finance other sports activities for most of its existence. It’s not closing because it’s not natural. What’s natural about damming up Lake Hiawatha and raising the water table by 4 feet? 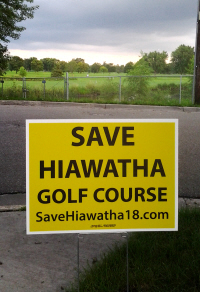 If people really want Lake Hiawatha to return to its natural state, then they should ask the Park Board and the Minnehaha Creek Watershed District to take down the dam at 27th Avenue. If they did that, they would lower the water level of Lake Hiawatha and the water table in the surrounding neighborhood. They could probably eliminate the need for pumping altogether, and the natural wetland of Lake Hiawatha would probably stay pretty much the way it is right now.